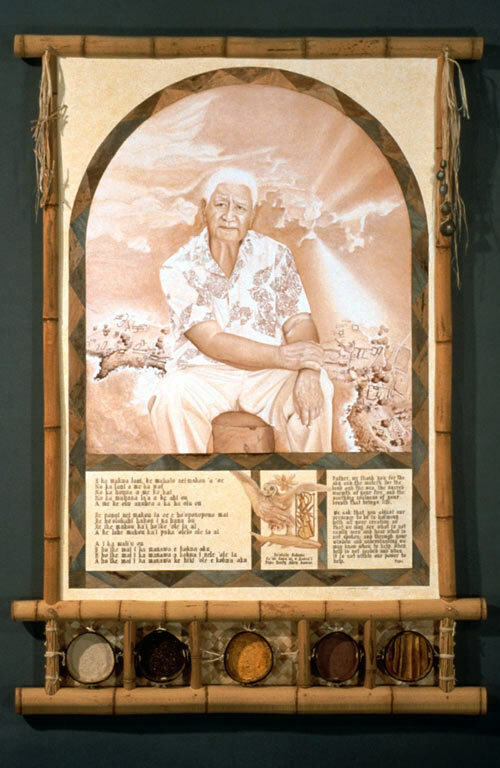 Po’okela Kahuna La’au Lapa’au O Hawai’i Papa Henry Allen Auwae, 1997 (6’ X 4’) bamboo framed mixed media portrait commission for Dr. Earl Bakken for North Hawai’i Community Hospital, Kamuela, Hawai’i. Calley had the honor of studying La’au Lapa’au (traditional Hawaiian herbal medicine) as an apprentice for two years with Po’okela Kahuna La’au Lapa’au O Hawai’i Papa Henry Allen Auwae (the head holder of the knowledge of herbal medicine) Papa Henry known to everyone simply as Papa. This was the only class that Papa ever taught in la’au lapa’au, and interested people of many races and ages were called to their highest focus for the intensive two-year course. 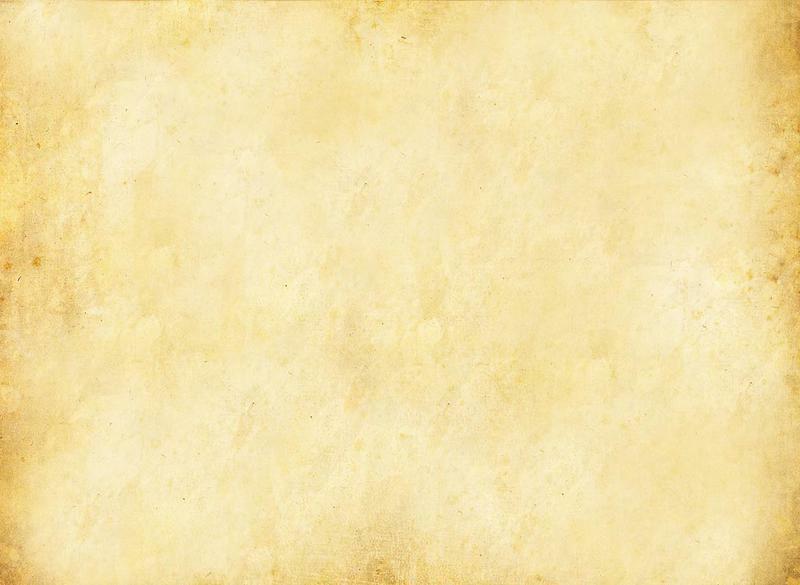 The class began with Papa describing some of his stringent requirements, such as, “If you want to sit down in this class, you will have to learn to weave a mat. 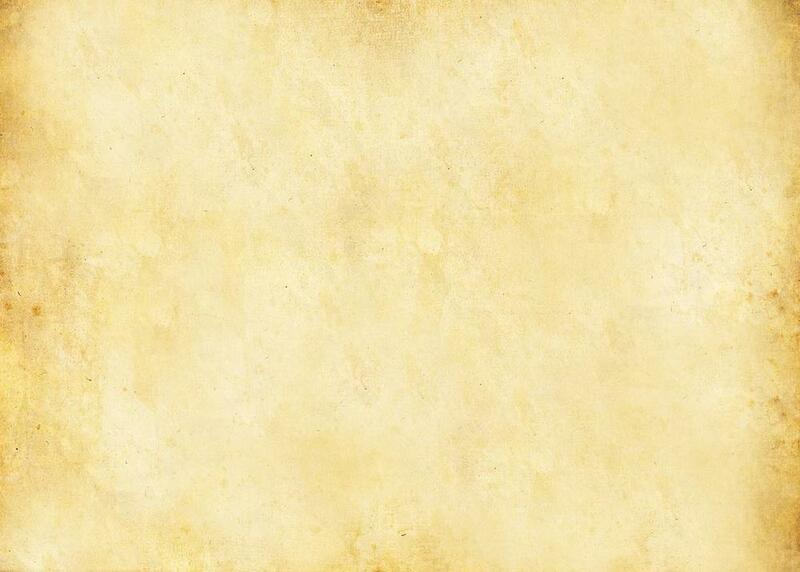 You are required to learn to chant The Lord’s Prayer in Hawaiian (no small task!) as well as numerous other sacred chants. Write a prayer for every time of day, such as on arising, before each meal, prayers of gratitude, a prayer for travel, a prayer for permission to hike, and so on.” That was just the beginning! And so began a challenging, life-changing adventure with the famous and demanding Papa Henry. Dr. Earl Bakken commissioned Calley to paint Papa, and that too was a challenging assignment. First Calley asked Papa’s permission, which was granted and then she embarked upon the design of the whole, including a complex hand-crafted, hand-lashed bamboo frames with hand-crafted coconut bowls filled with herbs on a hand-woven lauhala (pandanus) background. WAIMEA, Hawaii -- Hawaiian herbal healer "Papa" Henry Auwae healed the whole person, says Hawaiian culture practitioner, Angel Pilago. Auwae helped people's physiological and spiritual sides, said Pilago, who served with Auwae on a committee advising Kaloko-Honokohau National Historical Park. Born on the Big Island, Auwae attended Kamehameha Schools (where he got demerits for speaking Hawaiian) and graduated from the University of Hawai’i with studies in psychology and criminology. Before retirement, he was superintendent of heavy equipment at Kulani prison. 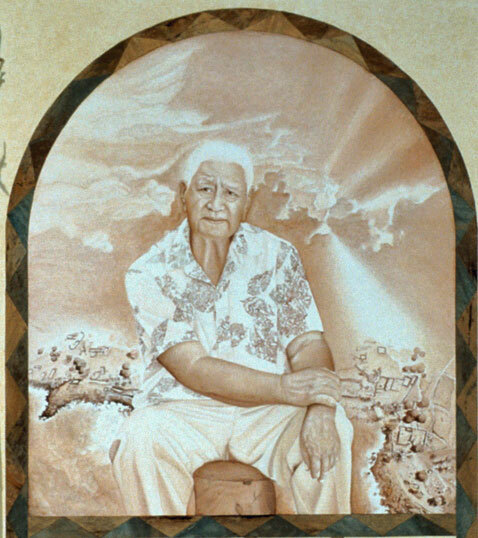 Auwae was best known as a kahuna la'au lapa'au, an herbalist, knowledge he learned from his 107-year-old great-great-grandmother from the Pai family associated with Honokohau. He treated people for ailments ranging from broken bones to AIDS, but refused to take money for his services, and avoided interfering with Western doctors. Among honors given to him was the title of "Living Treasure" bestowed by the Honolulu Honpa Hongwanji. Much of his healing dealt with mental and spiritual aspects. In that regard, he once advised that "Forbes Cave" Hawaiian artifacts removed from Bishop Museum should be returned to protect people from mana associated with them. Auwae's assistant, Babette Galang, said Auwae often told people, "Love your family, love yourself, and love God." Each component of the large easel painting required a great deal of careful attention, beginning with the proper protocols for harvesting the materials. After proper harvest, Calley took to cleaning and sorting them, preparing them and creating the art. ​For example, Calley found Hawaiian bamboo, approached the plants with traditional protocol to request permission to harvest them for a worthy purpose. She learned how to fire-polish the bamboo, and it came out beautifully, with thin fragrant oils cleaning, sealing and protecting the bamboo from insects and weather. The same process was followed for the herbs and the coconuts. Calley approached the plants for permission, harvested them at the right time of day, and processed all of them by hand. KAILUA-KONA — The Department of Land and Natural Resources, Division of State Parks will close Lapakahi State Historical Park to the public from Friday October 26 through Sunday October 28, 2012 during the 18th annual gathering of traditional native Hawaiian healers. Members of Na Haumana La‘au Lapa‘au o Papa Auwae (students of Hawaiian herbal medicine with Papa Auwae) organize this annual event to share cultural healing practices with one another in order to perpetuate these traditions. Founder Papa Henry Auwae is recognized as a Hawaiian elder who practiced and shared healing traditions with other native healers and students for many years. Healing traditions include use of herbal and remedies from nature, lomilomi massage, prayer and other methods. “The Department is pleased that we can partner with Na Haumana La‘au Lapa‘au o Papa Auwae in the perpetuation of Hawaiian traditional practices, as one of our core responsibilities,” said William J. Aila, Jr., DLNR Chairperson. Lapakahi State Historic Park has been rededicated as a healing site. The group has a formal curatorship agreement for Lapakahi with the Division of State Parks. The Board of Land and Natural Resources has authorized the annual event in recognition of the needs of the native Hawaiian community to perpetuate and improve the health conditions of the native people.